Landing in Seattle from San Francisco, we made our way to the Thrifty hire car office; we would be hiring a car and driving across Canada and the US to New York. My Mum and Dad would be joining us in Vancouver for two weeks till Chicago. We anticipated the car hire being tricky and we were right; despite it being booked online already. My Dad needed to be second driver but he was in Vancouver and I didn’t have a credit card in my name, only a debit. After much discussion Mike ended up being the main driver (even though he isn’t driving) and we’d have to go to an office in Vancouver to add my Dad. After an hour we had our Nissan Pathfinder and were on the road (once we had worked out the complicated controls!). No ease into the driving; straight on the freeway. The first few minutes were nerve wracking being on the right hand side of the road and the confusing road layouts but I got use to it. After a lunch stop, we arrived at the US border in about an hour and 20 minutes. 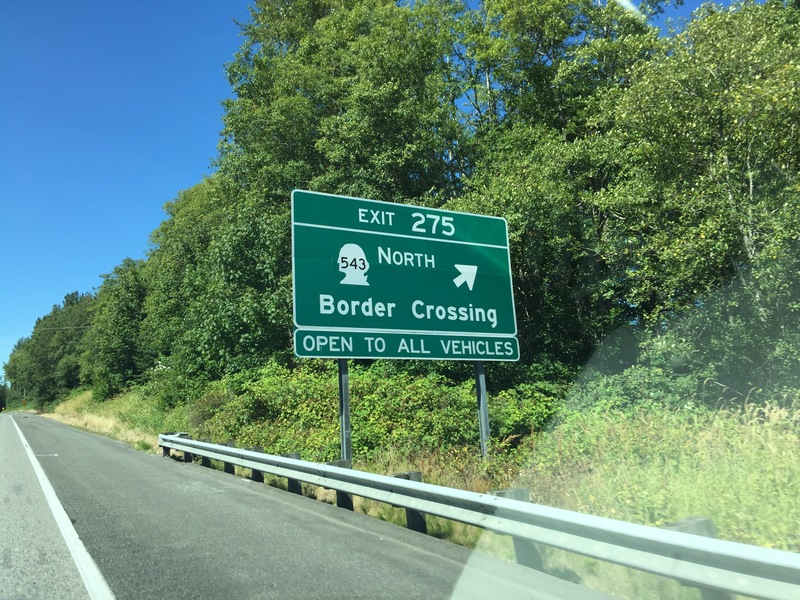 The border was relatively simple and after a small queue and a couple of questions we were stamped into Canada and on our way. Surprisingly no US stamp out just the Canadian stamp in. 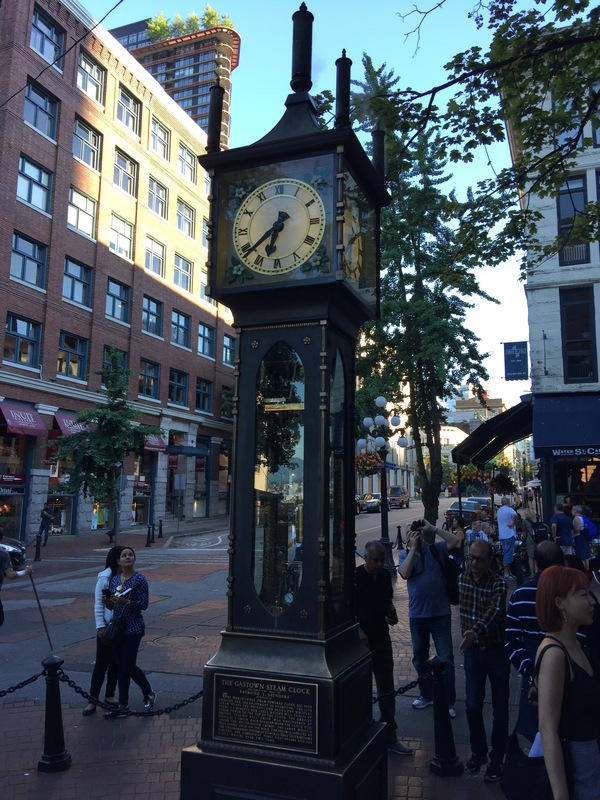 Another hour and we were in central Vancouver. Our hotel was near the harbour/gas town area and there was a convenient car park next door. While checking in to our hostel I could here some very excited parents downstairs wondering if they had found the right place. They had arrived 2 days before from England, and after lots of hugs, we put down our bags, quickly changed and went for a drink down on the waterfront. It was good to see them and catch up after 8 months! A cruise ship was in town, so the harbour area was busy but we found somewhere for beers and wine. We caught them up on our travels and planned our road trip for the next two weeks. For dinner we changed pubs and went to one in gas town round the corner. A busy hip place that specialised in pork but had lots of options. We got some much needed shut eye ready for an early start to explore Vancouver. We met down by the bus stop in the morning and bought tickets for the hop on hop off bus and Capilano suspension bridge. First we took the free shuttle to Capilano; a forested area over the suspension bridge with tree and cliff walls made famous by its pedestrian suspension bridge. First we walked across the 140m swaying bridge 70m above the Capilano river and being one of the first in the park it was empty(ish). Mike and Mum weren’t fans but it was a fun experience and nice for selfies! On the other side we grabbed a coffee and hot chocolate and made our way up the treetops walk. A suspended high line walk through the Douglas Firs at heights of up to 33m. The trees the walk is attached to are massive and hundreds of years old. A gave a great squirrels eye view of the forrest below and around. We descended and took a walk around the forest looking down at the river, and learning about the ancient trees and forest. 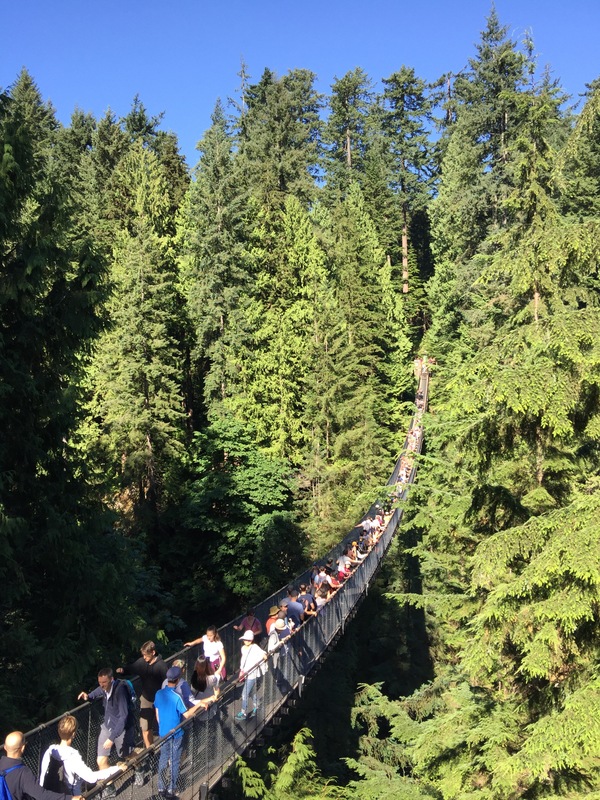 Then we crossed back across the suspension bridge and walked along the cliff edge on the cantilevered and suspended walkways jutting out from the granite cliff face above Capilano River. Mike didn’t look down and avoided the glass sections but it made around the cliffs suspended above the river. It gave some nice views of the park, river and forest. Next we took the free shuttle bus back to Vancouver and got off in Stanley Park, where we walked for an hour or so and saw the harbour and American Indian totem poles. Then we jumped on the hop on hop off bus and made our way around the city, listening to the cringe worthy commentary and got off at Granville Island. Granville island is basically a foody and market area selling local artisan crafts and art and a huge range of food. We wonder e around the food market and each found something for lunch. All worldwide cuisines were available and we had a variety between us. After lunch we headed back on the bus and enjoyed the tour of the city and got off in Gas Town. The Thirfty car rental office was nearby so we went in to put Dad on the car as a second driver. However as it was a franchise we couldn’t and were told we’d have to go to the airport to do it! Highly frustrating we made plans to go via the airport in the morning to sort it out. That evening we headed out for dinner at a restaurant mum and dad had been recommended uptown. It called itself a tapas restaurant but was really just smaller dishes brought out as and when they were ready. We ordered 6 dishes between the four of us and they were all very tasty if not a little difficult to share. After we had a drink at a local bar and made plans for our first part of our road trip the following day towards Banff. 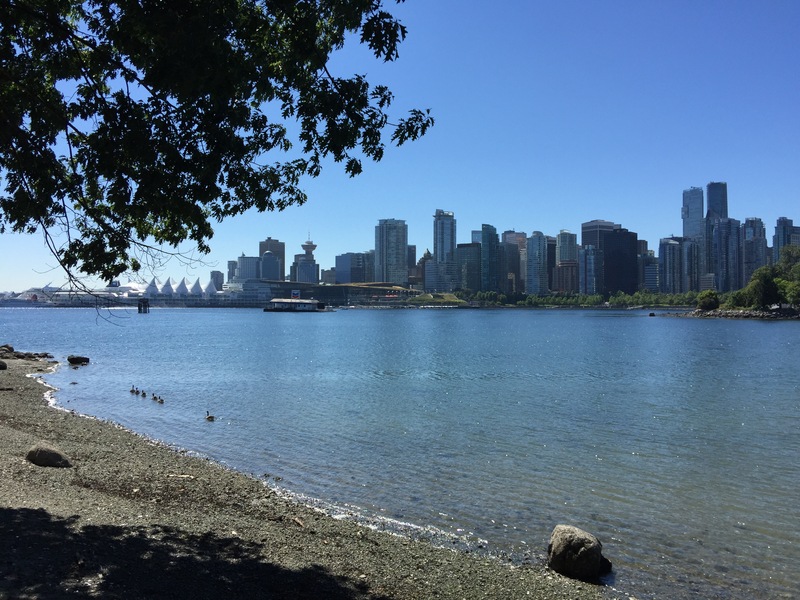 Vancouver was a beautiful city and very liveable if not expensive. It was now time to experience some Canadian wilderness.